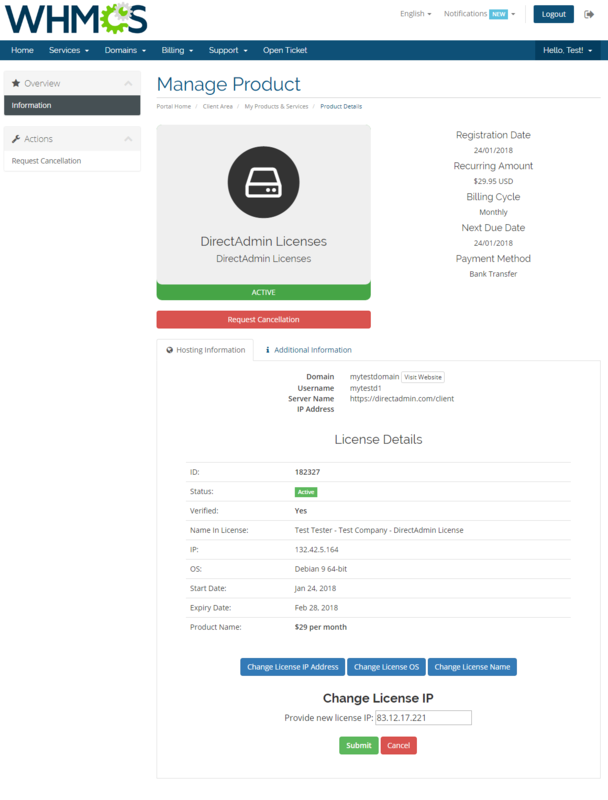 ModulesGarden DirectAdmin Licenses For WHMCS will allow you to automate the provisioning of DirectAdmin licenses straight in your WHMCS. The module will activate the licenses instantly and let your customers manage their key features in your own client area. Our product is a simple yet well-thought tool that will let you view precise information about ordered licenses as well as choose between automatic and manual payments. You will be free to make alterations to such focal details as the name of a license or its operating system, as well as decide whether it shall be terminated at the time of its suspension or not. Given its potential to combine finely with Product Linker For WHMCS so as to provide your clients with attractive product bundles, like a VPS server with an active DirectAdmin license, this module is nothing short of a worthy investment! Undoubted advantage of DirectAdmin Licenses For WHMCS is the unique fusion of simplicity and ease of use, making it a number one solution for each reseller of DirectAdmin licenses. Order our module today, extend the coverage of your business and start reselling licenses through a world-famous automation platform. Resell Dedicated Servers from Limestone Networks white label API.